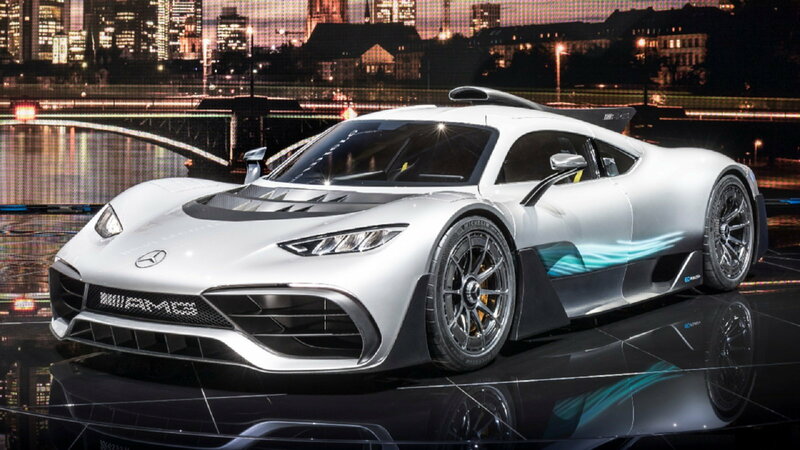 The long-awaited AMG Project One Hypercar made its official debut at this year's Frankfurt Motor Show, and while it may not be the final iteration that will soon be sold to customers, sources claim that the car seen here is very close in spec to the production version. 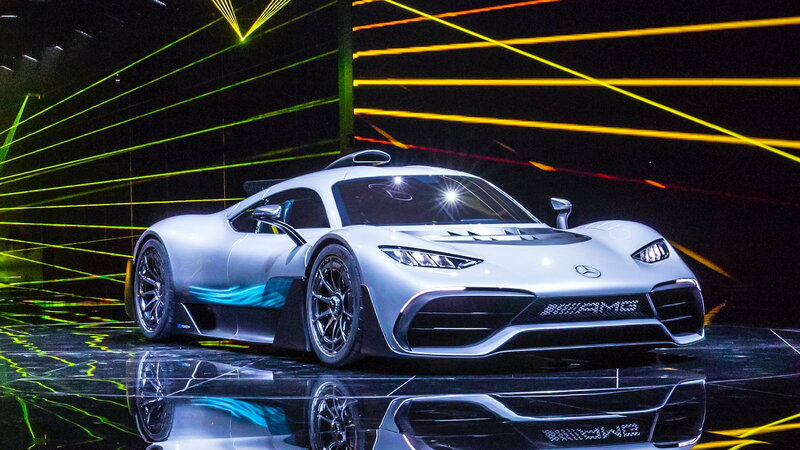 Mercedes stunned visitors of the 2017 Frankfurt Motor Show with the unveiling of their new Project One Hypercar. The big news with the Project One is that it lifts much of its technology directly from the Mercedes-AMG Formula 1 race car. It looks sleek, is packed full of technology, and in turn will be very very fast. As capable as this car is likely to be on the race track, Mercedes claims that it will be equally as comfortable cruising the streets. >>Join the conversation about The New AMG Project One Hypercar right here in the Mercedes-Benz World Forum! In an unprecedented move, Mercedes has placed its Formula 1 technology straight into a street going vehicle. The engine is a turbocharged 90-degree V6 that displaces a miniscule 1.6L. 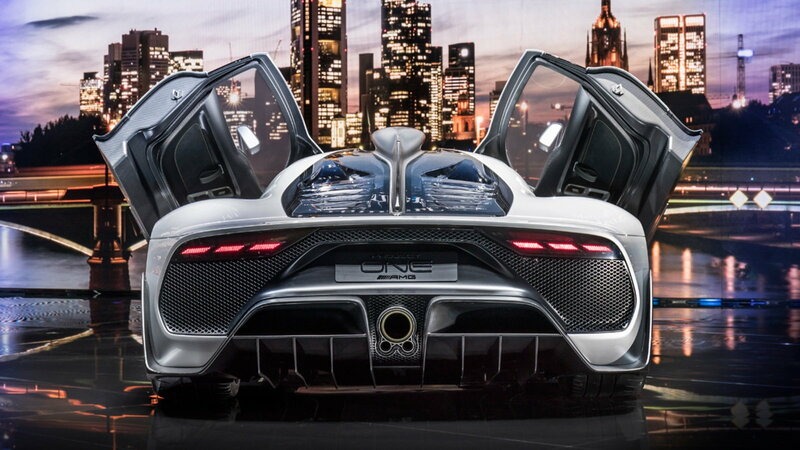 Like the F1 engine, the Project One is expected to have four overhead camshafts with four valves per cylinder, pneumatic valve springs, and use direct fuel injection. Additionally, the engine will use the same split turbocharger design as the race engine in which the compressor side of the turbo is situated in front of the engine and connected via a shaft to the hot turbine placed aft of the engine. For the sake of road manners and longevity, the redline has been reduced from 15,000 rpm to 11,200 rpm with an idle speed of roughly 1,000 revs. The combustion engine alone is said to produce 520 horsepower. In addition to the combustion engine, the Project One will have a total of four electric engines aiding in propulsion. The first electric unit is integrated into the turbocharger shaft in order to quickly spool the turbo to reduce lag while also being capable of generating electricity when the turbine is producing more power than needed by the compressor. This MGU-H (Motor Generator Unit-Heat) is said to produce 120 horsepower. Two 161 horsepower electric motors will power each front wheel while also having the ability to recover up to 80 percent of deceleration energy through regenerative braking. The last 120kw electric unit (MGU Kinetic) will be coupled directly to the engine's crankshaft to aid in driving the rear wheels. The car is expected to have a larger version of the Formula 1 car's high-voltage lithium-ion battery to take advantage of the four electric motors being used. The Project One supposedly has 20 miles of electric range, which means the battery will have a capacity of around 5.0kWh. This approximately 230-pound battery is placed just behind the front wheels to help centralize weight distribution and minimize the lengths of high-capacity electrical cables used. All said and done, the car will make over 1,000 horsepower! Even more impressive is the fact that Mercedes claims the thermal efficiency of the entire power unit to be better than any other production vehicle at over 40 percent. Although we are caught up in the performance and tech packed into the engine, there are tons of other cool things going on with the Project One. 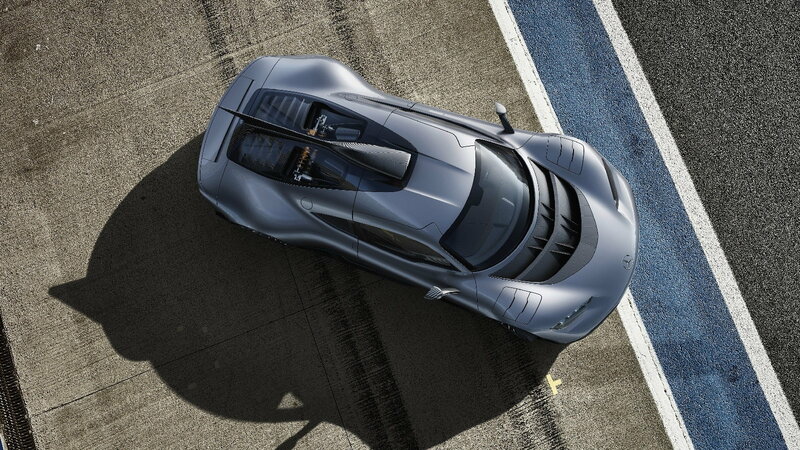 The body and monocoque structure are made of carbon fiber with numerous aerodynamic components sprinkled throughout. Active aero is used in the front spoiler, dual-stage rear wing, and front fender louvers. The brakes are massive carbon ceramic units that are further cooled by forged aluminum wheels with carbon fiber airflow shrouds. The suspension system borrows from Formula 1 with the engine and transmission (an automated single clutch 8-speed) providing structural support to the rear, and both ends of the car using pushrod activated inboard dampers. Unlike the Formula 1 car, two dampers are used at each axle with one acting to control the vertical motions of the wheels while the other works to minimize body roll. The interior of the Project One is simple and classy with an abundance of the monocoque's carbon fiber and door panels left raw. The fixed bucket seats are actually integrated into the monocoque itself, so driver positioning is controlled by the electrically adjustable steering wheel and pedals. The steering wheel is an F1 design that uses various buttons to control vehicles modes and the infotainment system. The instrument cluster and infotainment system both use 10" digital displays to eliminate interior clutter. A pair of air-conditioning vents are centered above the console while each door cutout includes an additional vent. Overall the interior is devoid of excess gadgetry to provide an elegant, yet high tech atmosphere. 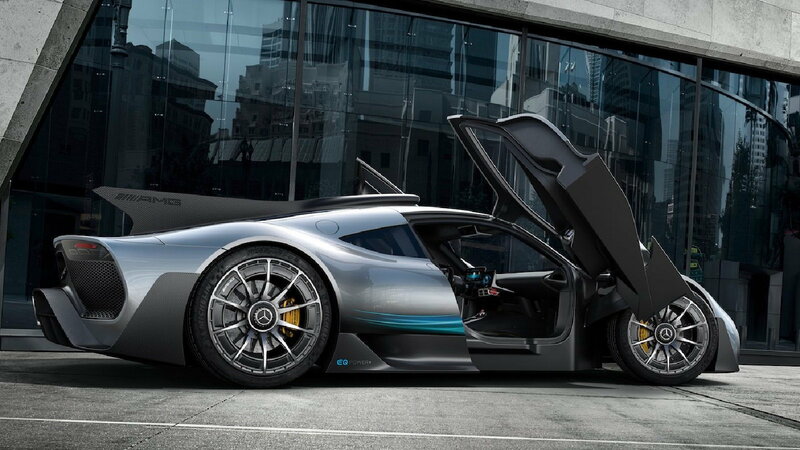 The AMG Project One is as exclusive as they come with only 275 units scheduled to be produced. Every car is said to be spoken for at a price of $2.7 million each. Production is set to begin in the latter half of 2019. 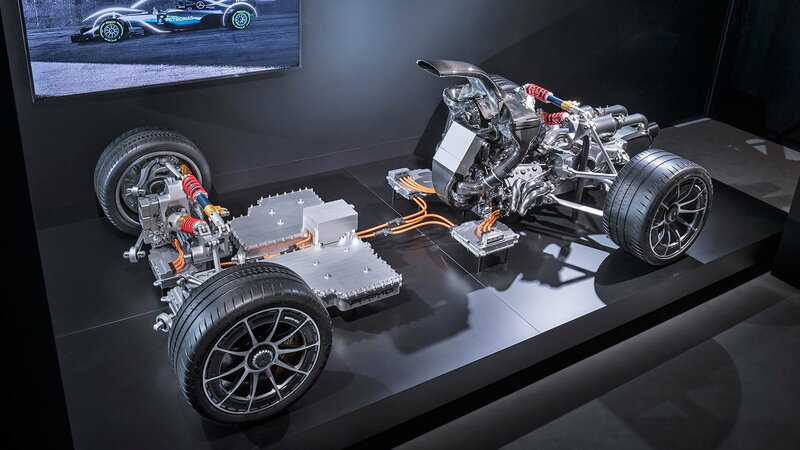 Mercedes claims the plug-in hybrid weighs a svelte 1,000 kilograms (2,200 lbs) and produces upwards of 1,000 horsepower, thus equating to a power to weight ratio near the coveted 1:1 mark. The car is expected to accelerate to 124 mph in under 6 seconds and achieve a top speed of over 217 mph to put it amongst the most elite cars in the world. While this car may be out of reach for just about everyone, Mercedes expects much of the technology used in the Project One to eventually trickle down to other AMG models in their lineup. If the Project One is any indication of what the future holds, we'd say the future is looking pretty bright!